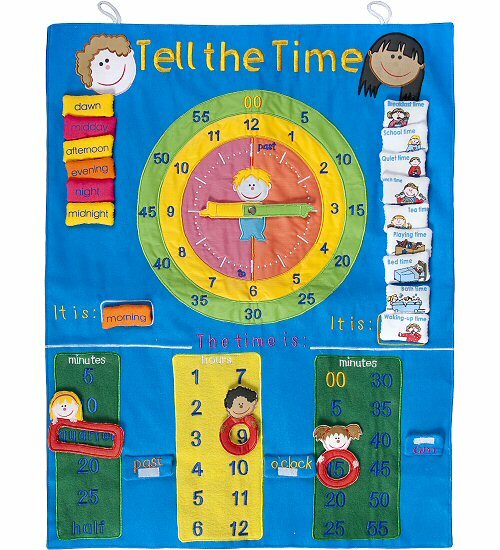 This Tell the Time cloth wall hanging is a fun, interactive way to help your child learn all about telling time. With beautifully embroidered details, the top section of this educational wall hanging has a large "clock" and features an adorable child with movable hands - yellow for hours and green for minutes. These hand colors correspond with the yellow hours circle and the green minutes circle around the outside of the clock, each with neatly embroidered numbers. Your kids will learn when to say "this many minutes" past the hour or "this many minutes" to the hour with the help of the split-colored clock face. The bottom part of this creative telling time tool has cute kid characters for selecting minutes and hours and lets your kids record the time in verbal as well as digital formats. 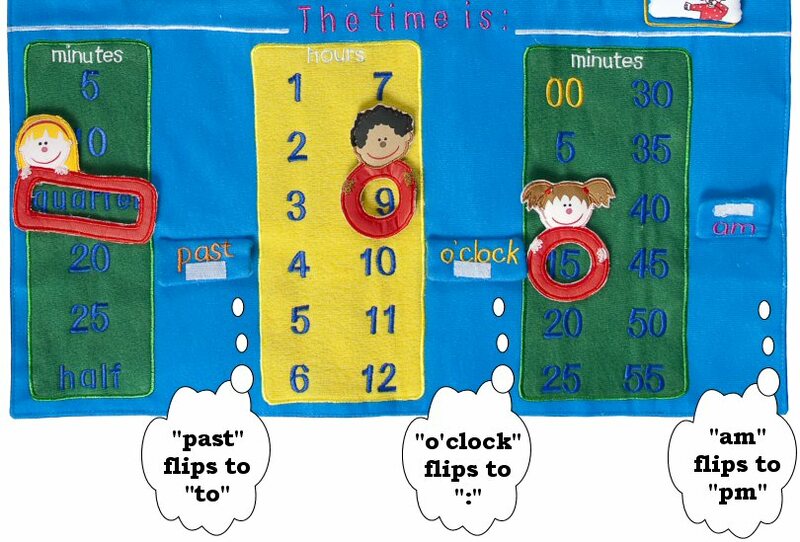 The verbal format utilizes the first two sections and allows your child to indicate whether the time is "so many" minutes past or "so many" minutes to the hour by simply flipping the past/to piece to reveal the correct word and then turning the o'clock/: piece to o'clock. Learning about the digital format of telling time incorporates the second and third section with the o'clock/: piece flipped to : and indicating whether it is before noon or after noon by flipping the am/pm piece to the correct side. Adding to the interactive fun of this educational cloth wall hanging are printed word pieces which help your child learn about which part of the day the time is part of (dawn, morning, midday, afternoon, evening, night, and midnight) as well as pieces with adorable screen-printed scenes that indicate the type of activities that occur during that time (wake up, breakfast, school, quiet, lunch, tea, playing, bed, and bath). 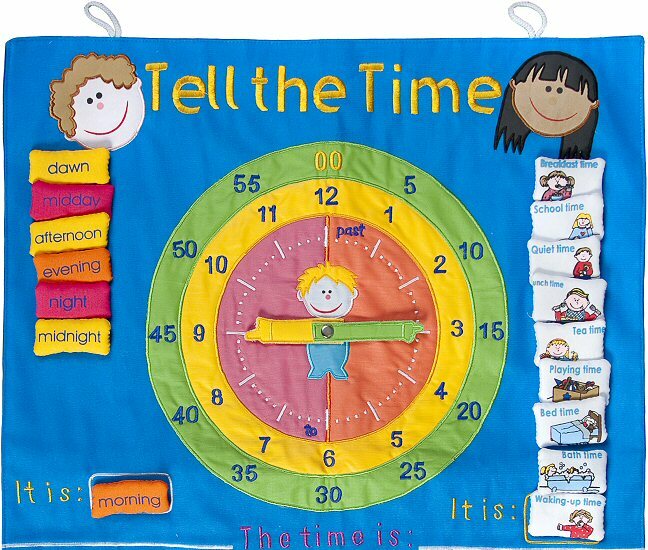 This colorful Tell the Time fabric wall hanging, complete with cute kid characters, beautiful embroidery, and Velcro-attached pieces, makes learning about telling time an interactive delight. My Calendar cloth wall hanging is pretty in pink and will help your child learn not only he days of the week, but months, seasons, weather, and more. With this interactive My Calendar cloth wall hanging, your child will learn more than just the days of the week. This My Calendar cloth wall hanging is an interactive calendar that will help your child learn the days of the week, months, seasons, weather, and more. Learning the alphabet has never been so much fun as it is with this My ABC Animals cloth wall hanging. This ABC Wall Hanging by Pockets of Learning will make learning ABCs fun and interactive. Children will delight in learning their ABCs with this ABC Wall Hanging by Pockets of Learning. Our ABC Animal Train cloth playset is a hand-crafted travel bag that unzips to reveal a train filled with colorful animals from A to Z. This Solar System wall hanging is both educational and interactive with colorful and movable puffy pieces. This hand-crafted Right at Home cloth activity book unzips to reveal eight familiar animals just waiting to be brought home.